No reproduction can do this painting justice. It’s enormous, seven feet high and twelve feet long, expansive yet exquisitely detailed, seemingly lit by the real sun. 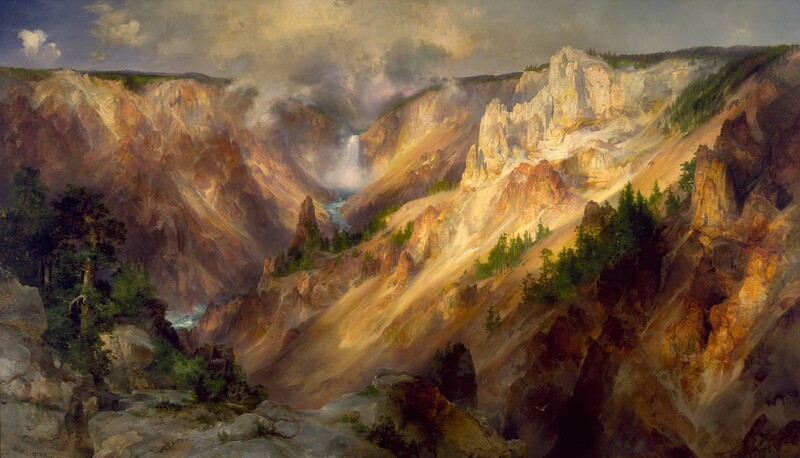 Thomas Moran’s Grand Canyon of the Yellowstone not only permanently changed American landscape art, it also changed how Americans thought of themselves and their country. Despite the painting’s misleading title, Moran’s painting depicts the Lower Yellowstone Falls in Wyoming. The Yellowstone River plunges 308 feet over the falls – twice the height of Niagara Falls (although with considerably less water, as the river is only 70 feet wide at this point, compared to Niagara’s half-mile). The largest volume waterfall in the American Rockies, the falls are so impressive that many early visitors greatly overestimated their height. An especially hyperbolic news story from 1867 lists the height at 1000 feet. Moran’s painting certainly emphasizes the magnificence of the scene. A native of England, Moran and his family settled in New York where he became an illustrator for Scribner’s Monthly, an illustrated monthly magazine published from 1870 to 1881. Moran first heard of Yellowstone after illustrating Nathaniel Langford’s account of the Washburn-Doane expedition through Yellowstone in 1870. His illustrations were based solely on Langford’s descriptions of these wild places he had never seen. Intrigued by Langford’s reports of soaring mountain peaks, endless rivers, and wide open skies, Moran convinced Jay Cooke, president of the Northern Pacific Railroad to finance his trip west. Cooke secured Moran a place on the Hayden Geological Survey, led by geologist Ferdinand Vandiveer Hayden. The survey left from Virginia and explored the northeastern corner of Wyoming that would later become Yellowstone National Park. Many people assume that national parks were set up purely for conservation purposes – making sure exquisite pockets of American wilderness remain so in the quickly evolving landscape. This is untrue. By and large, national parks were created to generate income from tourists. The Northern Pacific Railroad had a lot to gain from a major tourist attraction along their western line. Hayden’s entire expedition relied on the generosity of railroad magnates like Cooke, as well as federal funds. Along with famed landscape photographer William Jackson, Moran spent the expedition recording the beauty of the American west. Unlike Jackson’s photographs, which had to be painstakingly staged, Moran was free to sketch whenever and wherever he chose. He sketched the falls and canyon over and over from various vantage points and angles, determined to capture every aspect and color. When the survey returned in the fall of 1871, both Moran’s sketchbook and memory were full of nothing but the falls. A selection of these sketches illustrated Hayden’s exclusive article in Scribner’s describing the expedition. Many of these sketches would later be reworked in Grand Canyon of the Yellowstone. Always careful to explain that his paintings were not “literal transcripts from Nature,” Moran strove to portray the wild spirit of Yellowstone through his enormous painting, without tying himself to topographical and geological exactitude. The seven by twelve foot canvas took two months to paint. The resulting painting was immediately hailed as a masterpiece. In an era where not many people traveled, illustrations and paintings like Moran’s were Americans only window to the western frontier. Photographs, still grainy and black and white, couldn’t yet capture the sublime nature of Yellowstone, the magnificence and scale of the canyon. Americans, used to looking to the large cities of the eastern seaboard and to Europe for inspiration, now began to look west, and to consider the wide sky of the Rockies and beyond part of their natural birthright. This God-given beauty, so perfectly captured by Moran, was part of being American.